We live in volatile, complex, ambiguous times. The work environment for most employees is in constant flux and is less predictable than ever. About 40 percent of work today is non-routine, and the percentage of non-routine work is expected to grow to 65 percent of the average job by 2028. Non-routine work requires higher-order cognitive skills such as complex critical thinking, extensive data literacy, algorithmic thinking, problem-solving, creativity and real-time collaborative skills. Organizations need to provide ongoing support for employees to develop and grow their cognitive skills for non-routine work. Work today is also becoming more technical in nature. An example of the “technologizing” of jobs is the data science component of jobs today. Increasingly, organizations will need to build workforces of “citizen data scientists” and “citizen developers.” And yet, few employees possess even basic data analysis skills and even fewer know how to code in any language. The increased technologizing of jobs now requires organizations to continuously develop “hard skills” across the entire workforce. This takes a level of commitment to and investment in continuous learning that, until now, most organizations have been unwilling to make. With the above commentary as the backdrop, companies without a commitment to becoming hyper-learning entities risk falling behind. However, adopting a six-factor approach to becoming a hyper-learning entity can ensure that an organization not only stays relevant but also gets a jump on the competition. 1. VIEW INVESTMENT IN HUMAN CAPITAL DEVELOPMENT AS AN ASSET, NOT A COST. Many organizations underinvest in human capital development because they consider such spending to be a cost rather than an investment. That kind of thinking needs to change. Organizations must consider the development of human capital as an asset, not an operating expense. We need to treat continuous learning as an investment in future organizational success, not a cost to be minimized. Just as change is a permanent condition in organizations today, so must be the enablement of continuous learning through aggressive investment in learning and development for all employees. 2. CRACK THE NUT ON SUCCESSFULLY DELIVERING CONTINUOUS LEARNING TO EVERY EMPLOYEE. As a top management thinker, Chris Argyris admonished that “there is no organizational learning without individual learning.” Creating and sustaining competitive advantage in the future will be directly linked to a differentiated ability to rapidly deploy continuous and personalized skill development across a vast workforce. Organizations need to enable workers to learn, unlearn and relearn competencies and skills constantly. Those organizations that crack the nut on delivering continuous learning to the workforce — better and faster, with the least amount of friction for the learner — will be the winners in their markets. The process of finding learning content must be frictionless and targeted. The combination of a state-of-the-art learning discovery and delivery platform and microlearning content is critical to achieving that objective. Another requirement is a changed approach to the learning content delivery model. Modern digital solutions are replacing outdated delivery models associated with tethering learning to sporadic classroom experiences. As lifelong learners, employees need access to all-in-one learning platforms focused on new and emerging areas of technology and business. Much of the content on these learning platforms is enabled by just-in-time, microlearning assets such as three- to five-minute videos, short-form text explanations and targeted online self-paced courses. Today’s worker also spends a significant amount of time working within productivity and collaboration software applications and is always just a click away from accessing the web. As a result, training content must meet the learner where he or she is, instead of the other way around. If a learning platform is not directly embedded in the native environment in which a worker spends the day, the learner’s personal “application-web ecosystem,” it’s often a bridge too far for most employees to take the time to log into a separate learning management system or platform when they have to solve a problem quickly. Enabling learning in the flow of work means supporting learning in the context of realistic, open-ended and ill-defined problems and weaving the process of learning into self-directed activity. We need to treat continuous learning as an investment in future organizational success. 3. DEPLOY CONTENT SPECIFICALLY DESIGNED FOR EFFICIENCY AND EFFECTIVENESS TO FACILITATE RAPID SKILL ACQUISITION. Organizations must ensure that learning technologies will be ready to support personalized experiences, microlearning and just-in-time learning. Artificial intelligence (AI) and machine learning techniques will increasingly deliver this capability at scale. One example is automated recommendations that identify targeted development and learning opportunities based on what a learner knows and does today. Visual, short and engaging content drives engagement and retention. For a soft skills training module, for example, the content might involve exposing the learner to a realistic scenario which can demonstrate desired behaviors firsthand. Finally, learning content will continue to have a short shelf life which will increase the importance of constant curation of highly relevant content onto learning platforms. As the rate of change in new technologies accelerates, learners will need to be certain they are consuming the most current content available and that opportunities for learning are frequently refreshed. 4. ADOPT A LEARNING CULTURE THAT FOSTERS LEARNING AGILITY. Organizations must adopt a learning culture that stresses the importance of learning agility. Learning agility is the ability to analyze and understand complex situations, spot patterns that impact the business, assimilate new information, think flexibly, acknowledge mistakes (and learn from them) and take smart risks. Learning agility is arguably the most important trait for employees today. It helps people thrive, especially when the business context is complex, uncertain and ambiguous. Learning agility is about openness to new information and experiences and about being willing to explore complex situations and take on challenges. Leaders, in particular, need to coach for learning agility, helping teams to adapt to change and capitalize on new opportunities. Organizations need to develop two traits across their entire employee base to support a culture of learning agility. One is a growth mindset. The second is cognitive flexibility. It’s critical for leaders of organizations to build cultures which encourage a growth mindset. A growth mindset is a belief that, with practice and effort, abilities can grow, and it is a prerequisite for learning agility. Growth mindset needs to be proactively woven into hiring, onboarding, job descriptions, performance reviews and workforce development activities. Cognitive flexibility is key to learning agility because agile learners refrain from sticking rigidly to a narrow view of a situation. Instead, learners evaluate and embrace new information as they make sense of a situation, allowing them to adapt and grow. Managers are key to cultivating a learning agility culture. They can foster learning agility by making sure that people who disagree with prevailing opinions are heard during meetings, encourage diversity of thought and perspectives, give team members opportunities to work on cross-functional projects where they can pick up insights and perspectives from others in the organization, celebrate learning, not just results, and manage workflow so employees have time between deadlines to pause, engage in creative thought and exchange ideas. Finally, organizations with a learning agility culture make it psychologically safe for individuals to make mistakes during the learning process when they are trying out new ideas and skills. Organizational aversion to risk can inadvertently send the message that mistakes are unacceptable and that learning on the job and trying out new ideas can be career limiting. Fear inhibits learning. 5. DEVELOP AN OPERATIONAL EFFECTIVENESS PLAN FOR CONTINUOUS IMPROVEMENT IN TRAINING OUTCOMES. 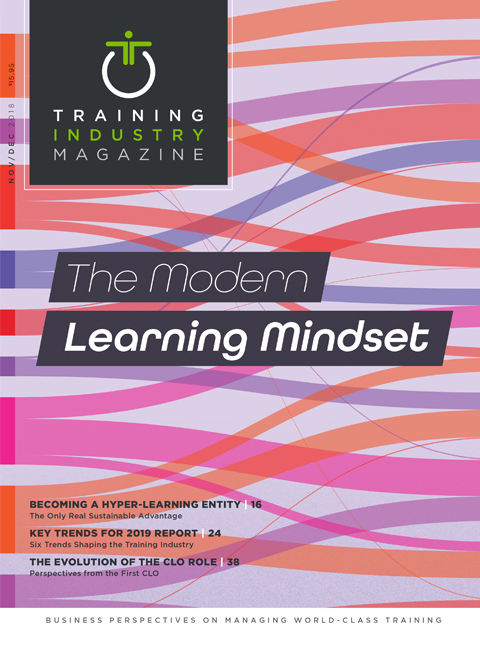 There will be a significant reward for any organization that can push out the training productivity frontier through training operational effectiveness, or TOE. The potential for pushing out the training productivity frontier through TOE will be facilitated by new technologies such as AI, data analytics, augmented reality and machine learning. For decades managers have been laser-focused on improving operational effectiveness and that same focus needs to be applied to training. Total quality management (TQM), lean, benchmarking and other management practices need to be applied more aggressively in the training context to improve learner satisfaction, eliminate inefficiencies, increase quality and lower cost. This will require organizations to adopt learning performance scoreboards with detailed metrics and KPIs that can be managed over time. These metrics should go beyond standard metrics, which surface training participation rates and usage metrics and instead include more training productivity metrics and business impact metrics. An example of a training productivity metric is the learning cycle time for a skill – average training time required for an employee to achieve mastery for a critical skill. Business impact metrics should focus on the impact of training and development which spurs innovation and increases productivity. Companies that eliminate wasted effort in learning, employ more advanced technology to improve their learning processes continuously, motivate employees better or have greater insight into managing particular learning activities will have a significant competitive advantage. 6. HOLD EVERY EMPLOYEE AND MANAGER ACCOUNTABLE FOR ONGOING LEARNING & DEVELOPMENT. Companies today need employees who demonstrate a naturally curious and questioning mindset and who have the raw potential for continuous learning. An assessment of this should be baked into every hiring interview. Once onboard, employees must have personal learning plans reviewed quarterly with managers. The learning plan should include both short-term and long-term learning goals with associated KPIs and a detailed road map for achieving those goals. The employee should then be held accountable for executing on the plan. When possible, compensation should be tied to achievement against learning goals and KPIs and outperformance should be acknowledged and rewarded. Organizations should publicly highlight when employees successfully complete valuable certification and accreditation programs or earn badges or nanodegrees in important competency domains. These successes can be touted in HR newsletters, intranet sites, senior management presentations and other venues to demonstrate the importance of continuous learning and to build momentum for continuous learning and skill development. Finally, organizational leaders should be measured on how successfully they guide the workforce from more specialized, functional mindsets and capabilities to more expansive digital mindsets and technical capabilities that are required of today’s businesses. The ability for human capital to continue to develop, grow, learn and contribute in new and different ways may be the only real sustainable competitive advantage for today’s organization. If companies adopt the six factors required to become hyper-learning entities, they will be on the path toward sustainable advantage. Heide Abelli is the senior vice president of Skillsoft Content Management.